With the Oscars fast approaching, it’s interesting to think about what the show might look like once Twitter’s new third party ad system in place. That’s the newly announced system whereby Twitter is going to allow Tweets to be surfaced as native advertising on third party apps and sites. Like the Super Bowl, the Oscars attracts a large global audience, and everyone is watching the show live, at the exact same time. As such, it’s one of the few events that still draws a real-time audience — even the Grammy’s were delayed for the West Coast this year. The Oscars, even more so than other event shows, is made for social media. There are dozens of readily identifiable stars (with sizable social media followings) coming in on the red carpet and heading up to the stage to present and accept awards. 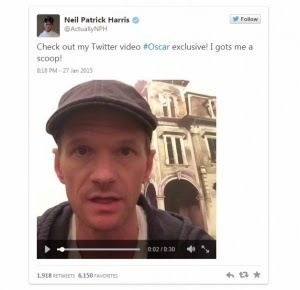 There’s the host, Neil Patrick Harris, who has 13.7 million Twitter followers and 1.3 million Instagram followers. There’s the fact that Twitter gave Harris the honor of producing the very first Twitter native video, a :30 promo for the Oscars that was shot with his phone’s camera. And of course there’s the world’s most famous selfie, the shot that Bradley Cooper took with Ellen DeGeneres that swiftly became the most retweeted photo ever. Now let’s imagine that Twitter’s third party ad serving platform had been in place last year. That photo could have been served up (by Samsung, the company who sponsored the photo and by the Osars themselves) and pushed out to hundreds of major websites and mobile apps, along with a call to action to tune into the Oscars now. I can only but imagine the amount of traffic that would have created, especially if it was part of a feed showing other key Oscar moments. Which is another thing to remember: in addition to spontaneous moments like the selfie, the Oscars are chockablock full of what you might call “tweetable moments” as well known actors come on stage to receive their awards. The real value of 2nd screen however, won’t be in the amount of tune-in those Twitter ads will drive. Rather, it will be in the data that the Oscars will be able to collect. They’ll be able to learn which skits created the most buzz and with whom, which ones drove the most tune-in and if there was a correlation between the two. They’ll learn which sites and apps drove the most traffic, which demographics are responding to which segments, which messages attached to the same photo or video worked best. They can use those findings for the next Oscars to build on and retain the current year’s audience. Determine which skits and jokes work best and which ones fell flat in order to guide next year’s script development. The data will also help them sell advertising, as they’ll be able to give potential advertisers a clearer snapshot of who their viewers are and then offer them different opportunities by combining on screen and 2nd screen options. That won’t be happening for the 2015 Oscars, but it’s something to think about as you’re watching: how much more powerful is 2nd screen going to be at next year’s show when Twitter’s third party site ad serving is in place. Originally published at www.2ndscreensociety.com on February 19, 2015.